That's what the president wrote this morning as retaliation for the morning show hosts, who at the outset had supported the tycoon in his election campaign, changing later their minds. The chain responsible for the program, MSNBC, responded that "it's a sad day for America when the president spends his time harassing, lying and vomiting personal attacks instead of doing his job." 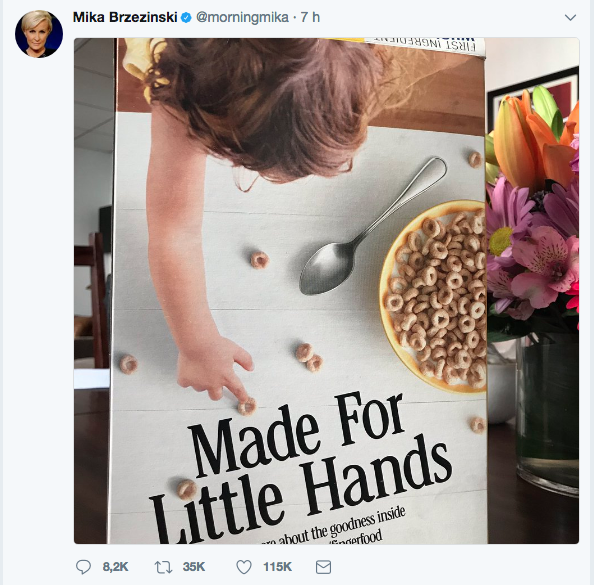 Almost immediately, the reactions against the president's comment were felt in the networks, starting with Brzezinski herself, who published a photo on twitter with an image that mocked the president's "little hands". Mark Kornblau, the president of public relations for NBC News and MSNBC, wrote that “Never imagined a day when I would think to myself, 'it is beneath my dignity to respond to the President of the United States'”, as reported by The Independent. Several politicians also made public their rejection of the president's behavior. Senator Lindsey Graham said that "this type of message represents the worst of politics in America," as Ben Sasse "begged him to please stop”, according to the newspaper El País. Nancy Pelosi, head of the Democratic minority in the House of Representatives, called on the president to apologize, saying his remarks were "sexist, an assault on freedom of the press and an insult to all women." Although many said the president would have "crossed the line" with his comments, the White House has supported Trump stating, the president has never been someone “who gets attacked and doesn't push back”, according to spokeswoman Sarah Huckabee Sanders. During the White House press conference, Sanders said the president "is a fighter" who will not stand idle in the face of the attacks, asking the media immediately what they would have done if Morning Joe's hosts had commented negatively to Barack Obama. One way or another, Donald Trump continues to demonstrate that as the habit doesn’t make the monk, neither will the title of president make the tycoon a man of good manners.